ZB Holdings sees its topline earnings growing 20% in the current financial year but warned this could be affected by the current economic turmoil that has seen cost structures shoot through the roof, businessdigest has learnt. The Reserve Bank of Zimbabwe last October ordered banks to create separate accounts for foreign currency holders, a move viewed as an indirect admission the bond note was not equal to the United States dollar. The country is battling with currency issues with the disparity between the surrogate currency and the US dollar fuelling price hikes. 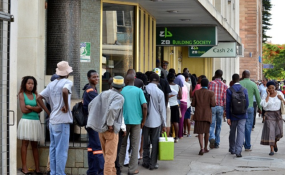 ZB Holdings CE Ron Mutandagayi said the banks' costs structure had gone up, making operations difficult. While the new accounts were a positive development for the bank, he said currency issues remained a big headache for the bank, adding his group was hoping that government would settle this matter as soon as possible. "We had projected that our growth will be around of 20%. Our account numbers have been going up but the cost structure has been going up. Our costs have been going up significantly," he said. "The growth prospects are likely to be affected by the macro-economic issues but we are hoping for a profitable 2019. We are sitting on significant nostro balances but the major challenge remains the currency issue. We are hoping that government will act and work on it as soon as possible." Mutandagayi said the group was however sitting on a significant number of new accounts and the uptake of FCA accounts has been pleasing but the issue of currency remained a problem. However, he said ZB remained bullish on economic growth prospects with an increased focus on guarantee programmes for loan growth driven by the construction industry targeting a 20% growth on the US$40 million worth of guarantees funded in FY 2017. The Word Bank recently projected 3,7% economic growth for Zimbabwe for FY 2019 although reality on the ground is pointing otherwise. Mutandagayi said the anticipated growth is expected to also drive expansion in the construction sector, increasing demand for bid bonds which the bank is willing to fund. "Strategic focus on guarantee programmes for loan growth targeting continues to be key (and) is hinging on the projected growth which will certainly open up the construction industry. As the sector grows, so does our funding on bid bonds. I can safely say we are looking at 20% growth on the US$40 million figure for 2017. I am not so sure of the 2018 figure but we are on the right path. I will be in the office tomorrow (Thursday). Its true reality is pointing the other way but we remain bullish of the outlook," he said.